Humans are suckers for symmetry and if the experts are correct, this comes from our very first view of the world. Scientists have long wondered where our love for the symmetrical comes from and have suggested that our first view of a mother's (or father's) symmetrical face begins our bias. Many find symmetry relaxing, as if the increase in order is important to us. I have often looked at some great photographs that are completely asymmetrical and are wonderful to look at. But part of the fascination is the LACK of symmetry. It breaks the order we are looking for and that small respite brings curiosity. It can add tension to the image that is attractive. Modern buildings, hair cuts and even fashion is embracing asymmetry as a way to draw attention. As if the lack of balance or order will draw us to it in order to understand. As for my photography I am often drawn to symmetry. I began doing this without realizing it but more and more I saw a pattern in my photos emerging. Like all photographers, I wanted to understand and avoid these patterns. Over time I realized that the bias for symmetry is so strong it is impossible for me to overcome it. If you can't beat them join them! 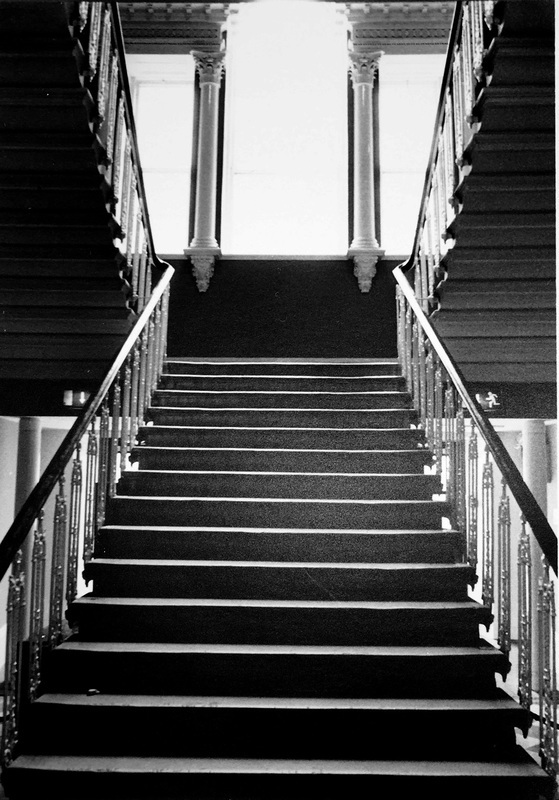 The picture of the stairs to the left (Nikon F2, HP5 ISO400) is a picture of a print I made in the darkroom. The symmetry of the stairs drew me to the image and while it lacks movement, gestures or a focusing elements, it is satisfying due to its order. I did not discover this symmetry. The architect did not accidentally build a symmetrical staircase. This was done purposefully, to give visitors a sense of order. The same reason the architect designed this is the reason I had to capture a picture of it. In the image below (Nikon D800) I created the symmetry. Obviously the boat house was built on the river long before I came by with my camera and tripod. 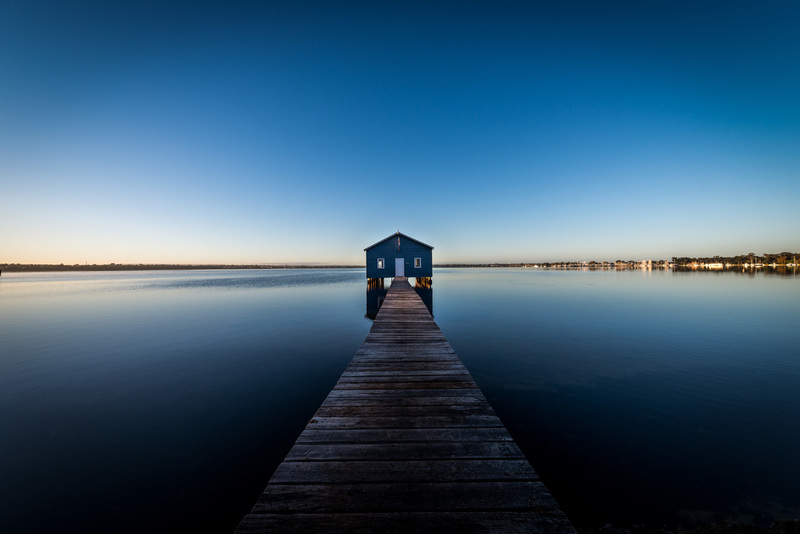 But the composition I selected, dividing the image with the horizon, placing the boathouse in the center and using the leading lines of the path in the center of the image creates the symmetry. I have taken multiple pictures of this boathouse trying to find a less obvious way to present it and all fail to compositionally please. 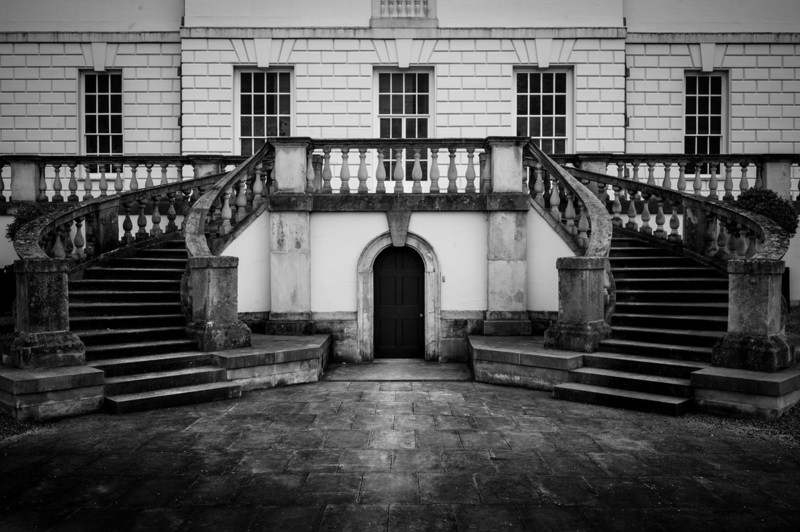 Symmetry is a powerful compositional element and if the subject fits, it is difficult to present it in another compositional setting. 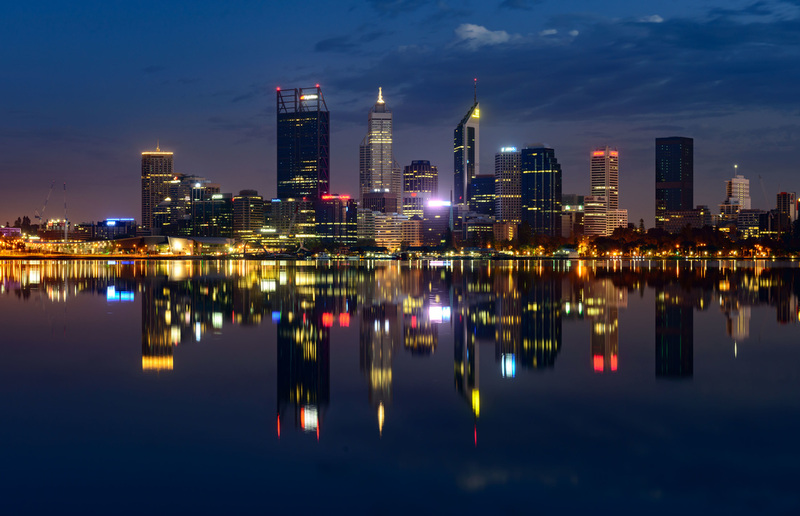 The most common method of showing the beauty of a city is through a very symmetrical shot of the cityscape (image below of Perth, Australia shot with the Nikon D800). Reflections in water provide the same symmetrical balance. The compositional element is often described by the term "balance". How often do we see a photographer or painter use "negative space" to balance our an image. This balance fills our need for symmetry. Without it the photo or painting seems off, and compositionally weak. Even a single element, sitting in the center of the frame defines the lines of symmetry needed. 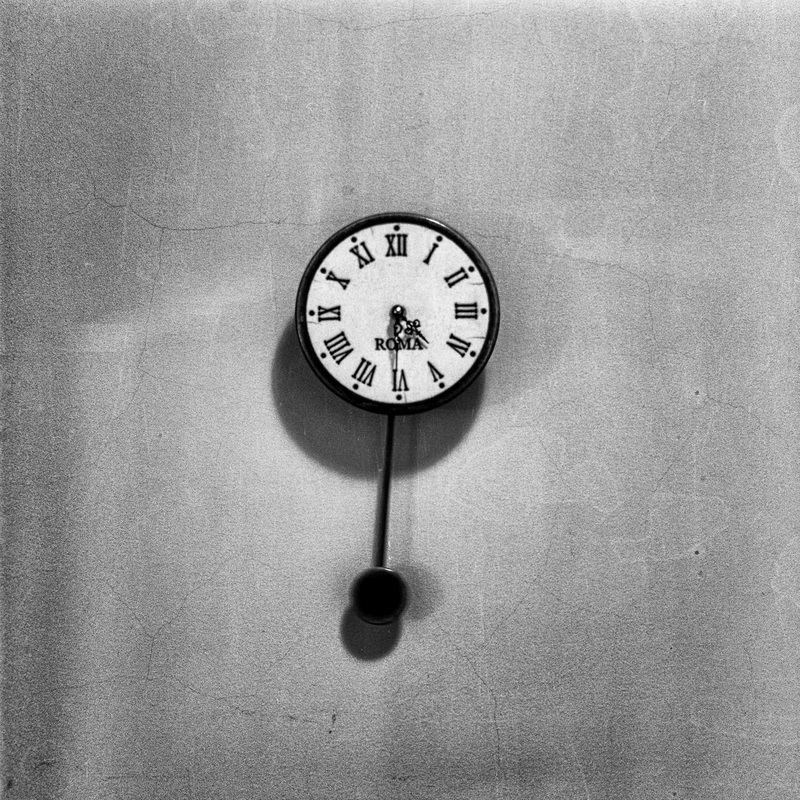 Again the picture on the left (Roma Clock Hasselblad 500cm Tri-X 400) was not a discovery of symmetry. Clock faces have been built based on our love of symmetry. The photo just highlights this by removing distracting elements around the clock and letting it sit alone. I struggle with compositional elements. This is why I am spending the time to look at different compositions with a critical eye. One of the few tools (or cheats) I have developed in my photography is that when I see a scene with potential but I am struggling with a composition that works, I purposefully look for the symmetrical balance that we humans love.